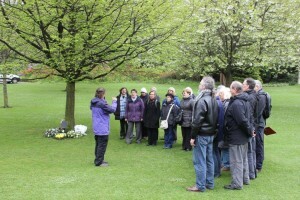 Over 60 peo­ple gath­ered at Edinburgh’s Work­ers Memo­r­i­al Day Tree in Princes Street Gar­dens to com­mem­o­rate Inter­na­tion­al Work­ers’ Memo­r­i­al Day on 28 April 2014. The gath­er­ing mourned all those who have died through work, but in par­tic­u­lar remem­bered the 30th anniver­sary of Bhopal, the 10th anniver­sary of Stock­line, the first anniver­sary of Rana Plaza, the April deaths of 13 Sher­pas (and those 3 still miss­ing) on Ever­est and Keane Wal­lis Ben­nett at Lib­er­ton High School and wor­ries about cur­rent and com­ing deaths among con­struc­tion work­ers in Qatar. The event was addressed by Ali­son John­stone, MSP, Sarah Boy­ack, MSP, Eurig Scan­drett of the Scot­tish Friends of Bhopal and Edinburgh’s Lord Provost, Don­ald Wil­son. Trib­utes were made and flow­ers laid by union branch­es includ­ing Unite, Uni­son, NASUWT, NUJ, PCS and ETUC. Scot­tish Gov­ern­ment and City of Edin­burgh Coun­cil flags were low­ered to half mast. Edin­burgh TUC and Scot­tish Haz­ards wel­come this clear com­mit­ment from the Scot­tish Gov­ern­ment, Par­lia­ment, the City of Edin­burgh and Edin­burgh Trade Unions to con­tin­ue and strength­en our ‘fight for the liv­ing’. 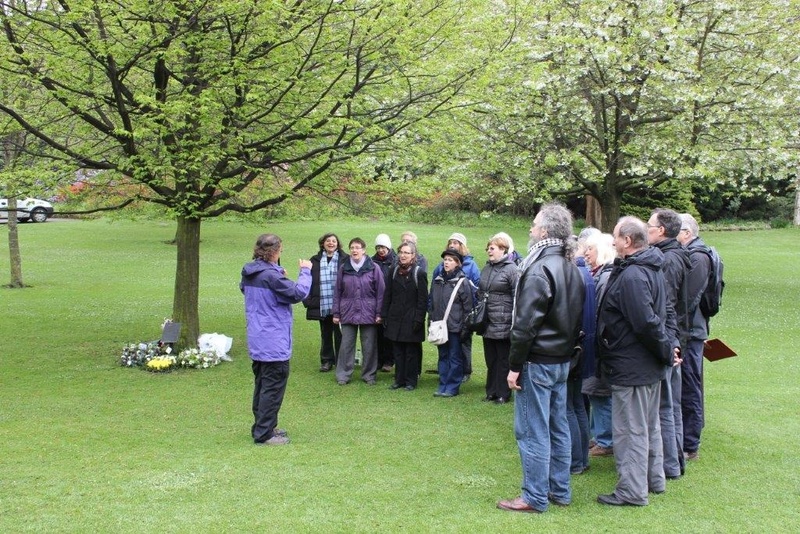 Thank you to the 25 mem­bers of Protest in Har­mo­ny who sang beau­ti­ful­ly on Mon­day and whose voic­es have become such an inte­gral part of Edinburgh’s Work­ers’ Memo­r­i­al Day com­mem­o­ra­tions.